Over three decades, Magic Me’s team of individual artists and staff have been growing our own rich, intergenerational arts practice. We have drawn inspiration and insights by collaborating with a wide variety of arts, cultural and heritage partners including over the years: LIFT, Tate, the National Portrait Gallery, the Photographer’s Gallery, Royal Court Young People’s Theatre, Masquerade 2000 and many others. Find out more about the residencies and partnership here. Barbican Open Labs give artists the chance to experiment in a working theatrical space without the expectation of a final product. In 2017 they provided support for the development stage of our Decorum project. You can read about the project here. We are currently working with arts organisation Metal (who are based in Liverpool, Peterborough and Southend) to take Decorum to a wider audience. Intergenerational groups are working with Magic Me and Metal artists in both Peterborough and Southend through Spring / Summer 2018, leading to the creation of films and performances to be launched later this year. Our most recent women’s projects have found a natural home at the Women of the World Festival at the Southbank Centre; both our first and second Decorum projects were part of the festival. Find more about the projects here. The Southbank Centre also hosted a Cocktails In Care Homes event in December 2017 providing the public with an opportunity to get a taste of what a Cocktails In Care Homes party is all about. Taking over the Clore Ballroom with a Mexican Christmas theme, the party brought together guests from three of our regular host homes, with many of our regular volunteers. Guests and visitors enjoyed music from our very own DJ Care Home Martin Astin, and cocktails created and served by Hawksmoor staff. Magic Me is a member of Flourishing Lives a London-wide coalition of organisations taking a creative, relational approach to supporting richer, more independent lives for older people. 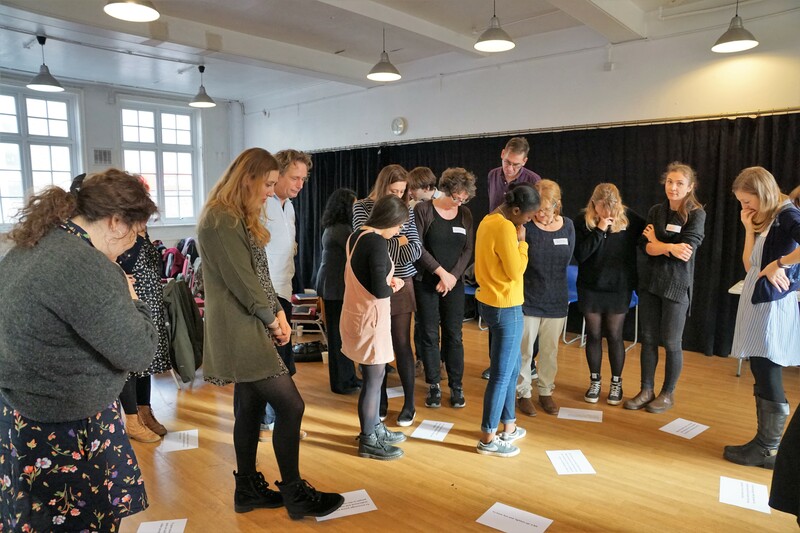 In Autumn 2017 our Director, Susan Langford and Programme Director, Kate Hodson ran a workshop on intergenerational arts practice for members, and we will be screening films from the Decorum project at the re:Generation festival at Tate Modern in May 2018. Change Creation works with visionary organisations to create and embed transformational change. Magic Me is part of the first cohort of the two year Change Creation programme, funded by Arts Council England. You can find out more about the programme here.